David Pinn | Brain Corp. Brain Corp is a San Diego-based AI company creating enterprise-grade core technology for the robotics industry. Our comprehensive BrainOS system supports the builders of autonomous machines in producing, deploying, and supporting robots across commercial industries and applications. In the world of robotics, Brain Corp doesn’t build physical robots; we provide core software and reference hardware to robotics companies and OEMS. Robots powered by BrainOS navigate autonomously, avoid obstacles, adapt to changing environments, manage data, and seamlessly interact with human users and other robots. These core capabilities are all enabled by BrainOS, empowering robot builders to focus on their own product differentiation and greatly streamline their time to market. 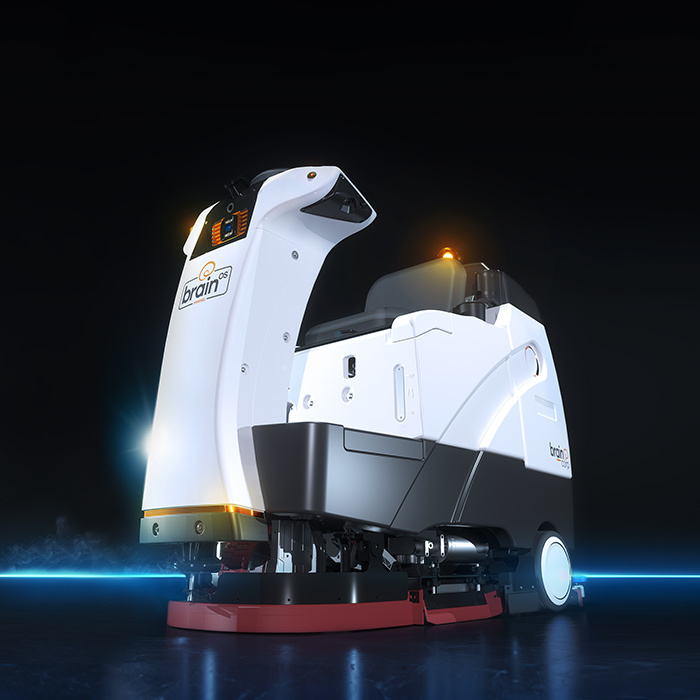 Our engineering teams are working with robotics companies and OEMs on applications in areas such as floor care, delivery robots, and security robots. Ultimately, we envision a world where people’s everyday lives are improved with the help of robots. Why did Brain Corp and Nilifisk decide to partner? Brain Corp is proud to partner with floor care industry leaders like Nilfisk. We are collaborating with them on the accelerated development of connected cleaning solutions by integrating BrainOS technology into their machines and bringing proven autonomous solutions to their customers. Is Nilfisk already using the technology or is the technology still in development? Brain and Nilfisk recently signed our partnership agreement and have begun our collaboration. We look forward to helping Nilfisk launch BrainOS-enabled equipment in the future. How does BrainOS differ from other autonomous solutions and technology? BrainOS is a cloud-connected operating system for commercial autonomous robots and has been in the market since 2015. Due to its maturity in the field, the network effect of fleet-generated data and real-world edge cases ensures safety, quality, and consistency across all BrainOS-powered machines. In addition, our comprehensive solution utilizes cloud connectivity, which facilitates fleet management, reporting, diagnostics, and seamless software updates across deployed machines. BrainOS isn’t just autonomous navigation. It’s a comprehensive solution that provides a full suite of core robotic technology “building blocks” that help producers of autonomous machines focus on their own core competencies. BrainOS is a flexible solution that provides instant infrastructure, mitigating the need for additional cloud services or environmental retrofits. With over 500 machines currently operating in the field, BrainOS-powered robots are proven and work collaboratively alongside people. Our robots use a straightforward, non-technical setup and utilize a learning-by-demonstration approach that enables end users to easily “teach” the robot before having it perform in autonomous mode. This collaborative robot-user experience ensures quick adoption and a fast track to profitability. BrainOS empowers the builders of today’s autonomous machines to lead the market by successfully producing, deploying, and supporting robots at scale. How will the partnership expand Brain Corp's portfolio of autonomous solutions? Brain Corp has partnered with the major OEM’s across the floor care space. The addition of Nilfisk to our partner portfolio solidifies our role as the leading provider in the industry. While we maintain a firm base in the robotic floor care space, BrainOS’ extensibility allows our partners to turn any manually-driven machine with wheels into a robot. Is this partnership the first-time Brain Corp has gone international? Brain Corp has announced other global partnerships in the past. For example, in 2018 Brain Corp partner SoftBank Robotics released Whiz, a BrainOS-powered autonomous commercial robot for sale in the Japanese market. Nilfisk is our first publicly-announced partner headquartered in Europe. Are there other projects in the works that you would like to discuss here? We’ve focused strongly on the floor care market for the last few years. You can expect Brain Corp to announce initiatives in new verticals throughout 2019 and beyond. David Pinn is a technology executive with a focus on finance, strategy, and corporate development. As Brain Corp's Vice President of Strategy, David is responsible for building and implementing growth plans and partnerships for San Diego's premier robotics company. Before his time with Brain Corp, David was head of finance for Antenna79, a technology startup backed by L Catterton, the world's largest consumer-focused private equity group. He was a founder of Snaptracs, Qualcomm's consumer electronics subsidiary, and he led a number of acquisitions and divestitures within Qualcomm's Strategic Finance group. Prior to his career in finance, David was an electrical engineer designing test systems for cellular, WiFi and Bluetooth applications. 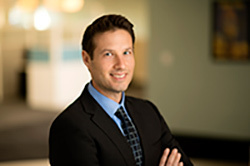 David received his undergraduate degree in Electrical Engineering from the University of Texas at Austin and completed an MBA at UC Berkeley where he was a Mayfield Fellow.